Night splints usually are designed to keep a person’s ankle in a neutral position overnight. Most individuals naturally sleep with the feet plantar-flexed, a position that causes the plantar fascia to be in a foreshortened position. A night dorsiflexion splint allows passive stretching of the calf and the plantar fascia during sleep. Theoretically, it also allows any healing to take place while the plantar fascia is in an elongated position, thus creating less tension with the first step in the morning. A night splint can be molded from plaster or fiberglass casting material or may be a prefabricated, commercially produced plastic brace. Several studies have shown that use of night splints has resulted in improvement in approximately 80 percent of patients using night splints. 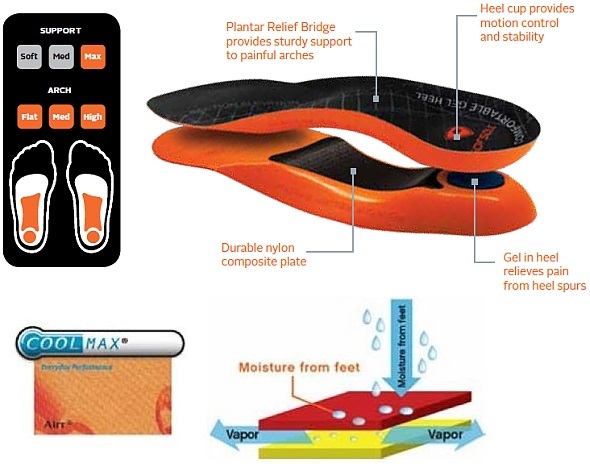 Other studies found that night splints were especially useful in individuals who had symptoms of plantar fasciitis that had been present for more than 12 months. Night splints were cited as the best treatment by approximately one third of the patients with plantar fasciitis who tried them. Disadvantages of night splints include mild discomfort, which may interfere with the patient’s or a bed partner’s ability to sleep. Stretching exercises for your foot are important. Do the stretches shown here at least twice a day. Don’t bounce when you stretch. Plantar fascia stretch. To do the plantar fascia stretch, stand straight with your hands against a wall and your injured leg slightly behind your other leg. Keeping your heels flat on the floor, slowly bend both knees. You should feel the stretch in the lower part of your leg. Hold the stretch for 10 to 15 seconds. Repeat the stretch 6 to 8 times. Calf stretch. Stand with your hands against a wall and your injured leg behind your other leg. With your injured leg straight, your heel flat on the floor and your foot pointed straight ahead, lean slowly forward, bending the other leg. You should feel the stretch in the middle of your calf. Hold the stretch for 10 to 15 seconds. Repeat the stretch 6 to 8 times. Other exercises. You can also strengthen your leg muscles by standing on the ball of your foot at the edge of a step and raising up as high as possible on your toes. Relax between toe raises and let your heel fall a little lower than the edge of the step. It’s also helpful to strengthen the foot by grabbing a towel with your toes as if you are going to pick up the towel with your foot. Repeat this exercise several times a day.